Last night we witnessed a grueling battle between PhantomRescue's Germans and Lothlann's Finns. 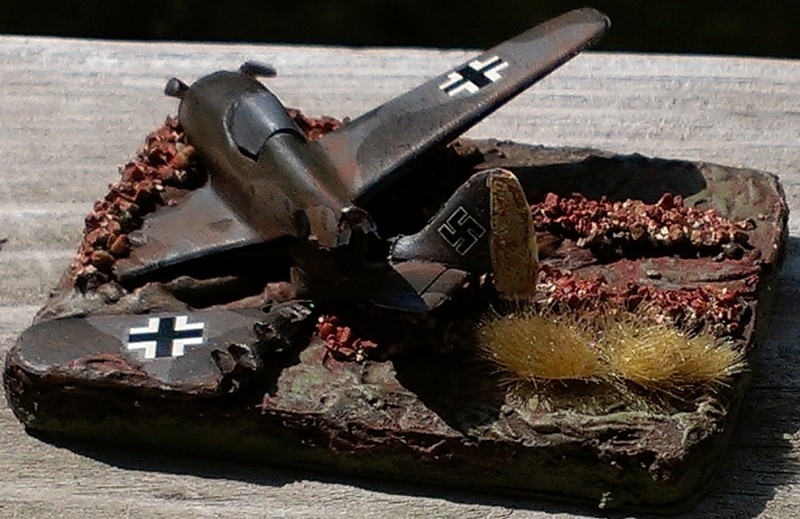 The mission was Cauldron, 1500 points Late War. 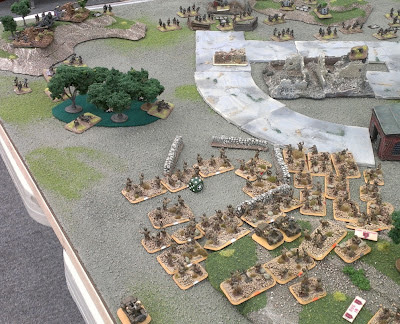 NOTE: the bocage(they played them as hedgerows) are none other than the new ones MattVarnish bought from WWPD's Luke at Historicon! I have been hard at work trying to get at least one playable surface completed so I can start playing some games at my house. Up until a little while ago I had no terrain to speak of and was just starting to buy some buildings here and there. I ended up getting a few rocky hills for my birthday, along with desert palms. Looking around for trees I was able to get some bamboo lengths, tree-top pieces and some material for fields. The table is not yet complete however, there are a few things I will be completing on this project. The ends need to be put on, the fabric covering requires a trim in a few areas and I will likely replace the playing surface with a one piece top. Currently I have 3 separate pieces of 2'x4' sheets of thin board being supported underneath. Attaching legs is still a necessity as I would like to use this table without needing a 6' or other surface under it. IKEA has great options for legs, that's right I said IKEA. A poker table I had built a few years ago for a friend has round legs that are able to screw into retaining pieces that are firmly attached to the table bottom, this will allow for easy storage. In an attempt to get some dice rolling and using this new surface I made a last minute phone call to Scotty to see if he would come over and have a game on a Tuesday night. 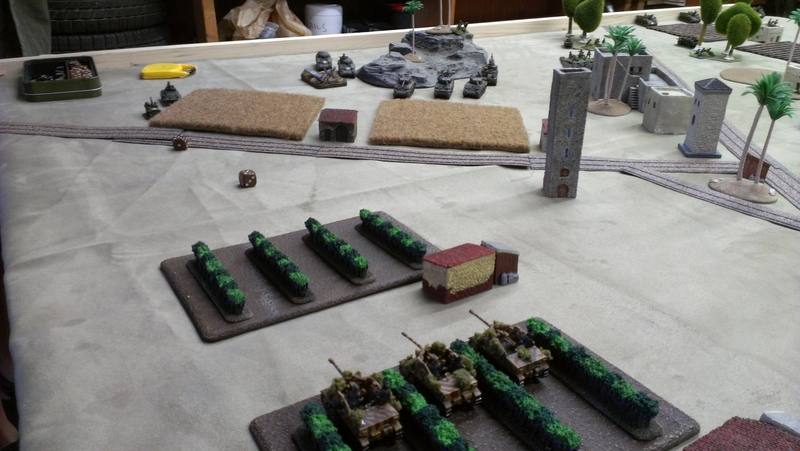 Late War 1500 points, with my Panzergren list vs his US armor list, we had a great game and unfortunately I made a few bad rolls trying to secure one of the the two flanks I was protecting. My Marder III's had no effect and the 88's on the other half of the board were subjected to repeated attacks without being able to hit back. 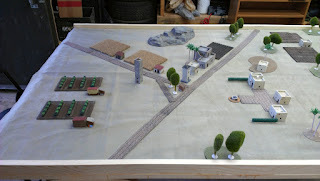 My table build will be in a another post shortly and some of the items and terrain I completed will be included. If you do not have any terrain to field at least one table, everything I did took very little money and not a lot of time to do. And second video has a tonne of coverage of the sales areas with some CRAZY prices on stuff. Clearly I am in the wrong business! Not that much of it went at those prices. If the vendor area is a bit dry for you, skip to 15:00 of video 2, the WWPD podcast intro is near the end. I'll add pics later today. So it was a small game with just Cash and myself on Friday. We rolled up Hasty Attack and played on a well laid out board that featured a 'Y' crossing in the centre of the terrain. I took this video with my HTC One S but decided I need to find a better way of managing the movie afterwards, I have yet to see if I can just shoot it as one continuous file. As of right now, converting the files and finding a decent frame rate and resolution is proving interesting. I might shoot in lower quality on my phone in the future. It still takes great pics though! Thank you to all who helped and Perkin's Hobbies, Freres de Batailles and The Hobby Centre for prize support. 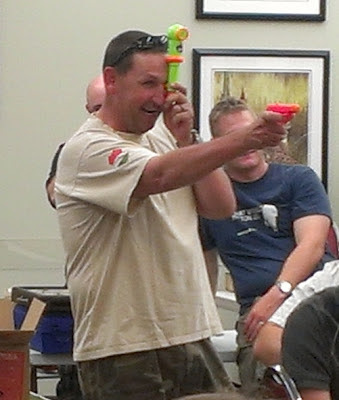 Check the new Summer Siege 2012 Gallery page up top for 180+ pictures of the action June 7th, 2012. OK! So it's early Sunday and the aftermath of Summer Siege has taken its toll on my army! 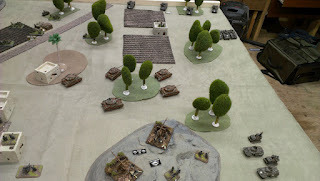 I learned a ton of info from playing in my second tournament and likely only my 20th game or so of Flames of War. Here's a better breakdown of what I experienced yesterday which ended in a 1-1-1 record. I promised to list what I used during the tournament so here it is, based out of the 'Grey Wolf' source book. It finally gave me a chance to table the bulk of the pre-painted German army I had bought from a friend in Kingston. 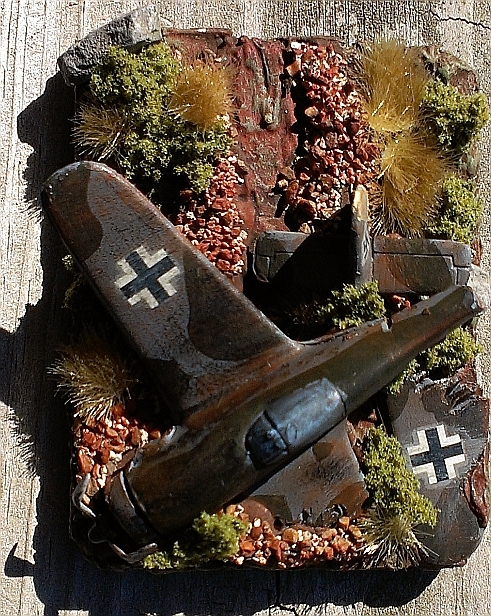 I added a few Plastic Soldier Company Panzer IV's and a pair of 88's I quickly painted to get ready for this event. My thinking with this list is it has a little bit of everything. I played against three very different Allied lists and the flexibility of the the chosen missions and what I was facing came in handy for each game. All units are Confident Veteran and I was able to make use of the full 1500 points. Game one I faced Yvon and his US Infantry list with a TON of artillery support. Obviously I need to start keeping track of other armies, or learn what everything is just by looking at it.....but you'll have to put up with my vague descriptions for now. I will have a look and post later if I can find the army lists from the tournament. 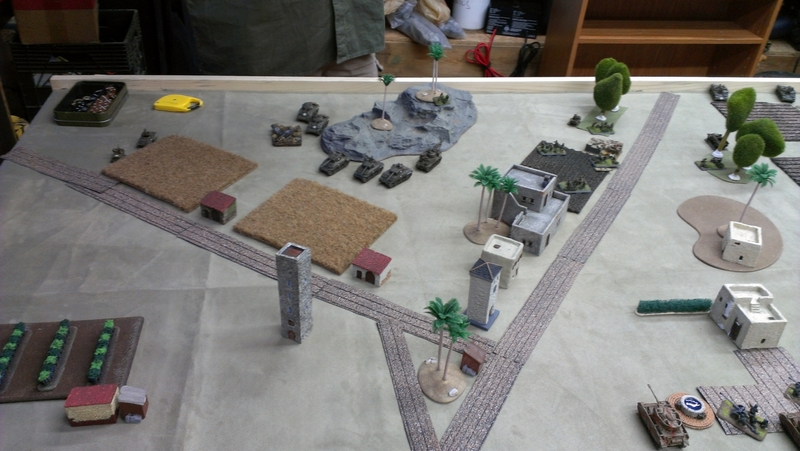 Played out on the 'Airfield' board that was setup with a huge open strip of concrete running down the center. I was able to deploy on this side of board and dig in around the small hill in the center and just in front of the bombed out farm house. 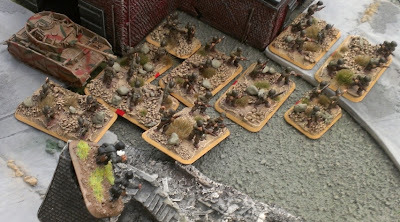 I could not do much to stop the advance and my opponent was quickly able to overrun my MG42's, Mortar platoon and threaten my 88's. I killed a few stands of infantry and 105 arty pieces with my Panzers, but was unable to destroy any platoons. The objectives were not live until turn 6 and I was able to hold out long enough for a win.....I'll take it. 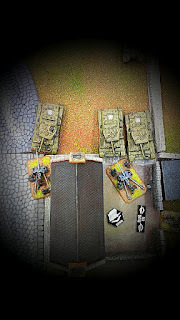 Tank terror was not an issue for the Allies, I think I killed two stands but quickly lost the Panzer. Game two can be summed up like this. ONE: Deploy units. TWO: Shoot and bail out two of three Stuarts. 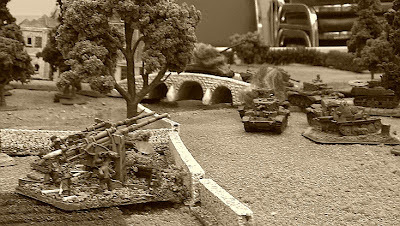 THREE: Lost PAK 38's to Cromwell onslaught. FOUR: AMBUSH!! 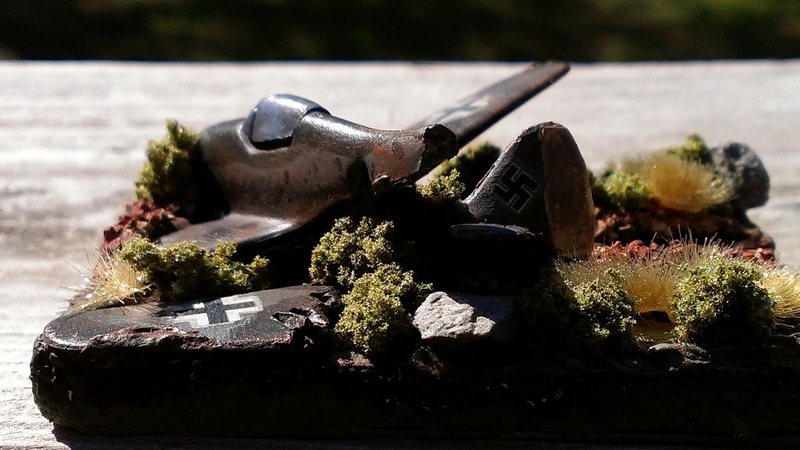 Pop out 88's and destroy some armor! FIVE: "Wait......what? Nothing within 4" of objective on your turn? Son of a #*&(^!! !.....OK, let's drink! It was over on turn 3 and was left thinking I had chosen the wrong side of 'The Town' to deploy my troops in. I did get some wicked shots and used a few special effects on my new HTC One S! Game three was an open affair on a desert table, playing as quickly as possible, I did not have any time to take any pics and it was a slugfest with a mix of tanks going head to head in the desert. 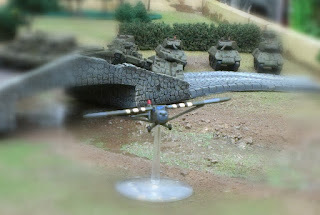 I was able to dispatch my opponents Firefly's, Shermans and recovery assets quickly. I did not come away unscathed, I lost 4/5 Panzers in the process as I could not get my crews to remount their bailed out tanks in three straight turns. I stuck around with my IC long enough to protect them from getting side and rear shots for a round or two, but was quickly overrun by my opponents special 'ability' to move and extra distance upon a successful skill check as long as this General was within command distance. A very good allied list and the best sport of the day. 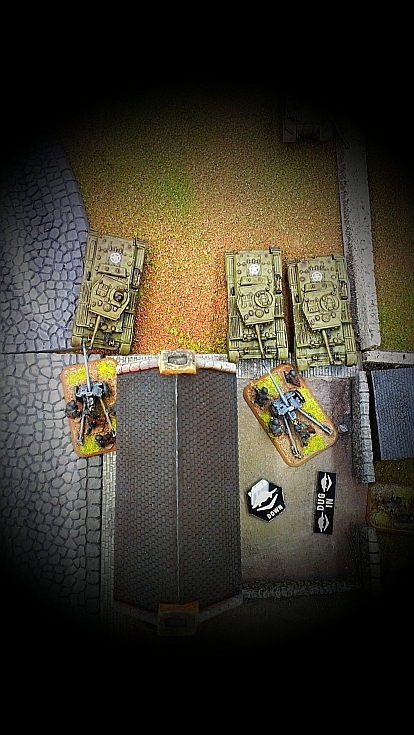 Hat's off to you Serge, was a good time without reserves until turn 5 or 6.......we ended on a draw with me gaining an extra point because I was able to dispatch of a platoon of his tanks. At the end of the tournament we had prizes, a few speeches and I came away with two paint sets courtesy of getting voted best sportsmanship! I appreciate the votes and it makes me aware that I am in it for the fun. I think I am getting better, but realize quickly I need to play test a lot more than ZERO when fielding a new army....but getting it painted was definitely more important to me. The event was a great success for the players involved. Brett and Rob overcame a few last minute curveballs of no-shows to put on a great tournament and the Royal Canadian Legion BRANCH#641 was a great venue and having a bar was a huge plus as Captain Morgan helps with my self morale checks when you lose a game in three turns. Scotty doesn't condone drinking and tanking......he HIGHLY recommends it. The club is putting on Summer Siege 2012 - at the Barrhaven Legion no less! You can check out the sweet venue here- with full bar! It is a Nationals Qualifier, with the top 2 placing players getting into Nationals! Stay tuned for full coverage on our site! Here's the pretty much finished TAPV (minus liquid greenstuff in the cracks) and my attempt at a remote weapons station. \If I decide I like it, I'll make a hole in the top of the hull and drop it in. I've also added some of the troops it will carry. 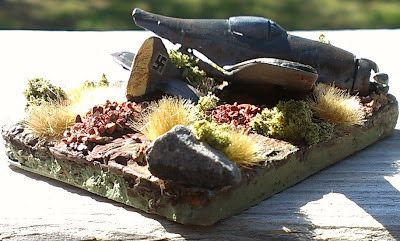 they have been assembled and base coated with Model Master \olive drab. I actually have about a third of the infantry completed, but just for fun, I'm showing them from the start of the painting stage. I've made great progress on my TAPV and its almost ready for molding. I just have to add the little nubs to the add on armour pieces. I still need to make the remotge weapons station with a heavy stubber and an auto cannon. I also need to come up with one more set of lights like the one in the above photo.